Photo of Harry OO (left) and Harry Jr. by Leon Laing. We posted our first story of Harry Colon (aka Harry OO) two years ago, which was before vigoronline.com’s relaunch. The independent record store proprietor continues to support local music today, so we decided to repost that story. On July 30, Colon will host a meet and greet/casting call for celebrity rapper Persia. And he just dropped his Stop & Listen mixtape, a compilation of Central Pa.’s finest artists. Harry Colon is hip-hop. 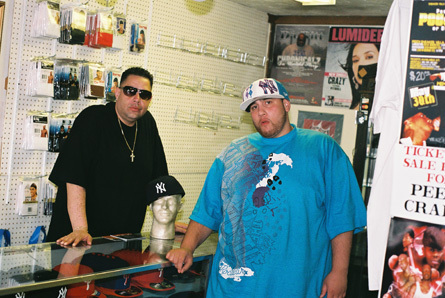 Born in Puerto Rico and raised in the Boogie Down Bronx, known as the birthplace of rap music, Colon owns Da Underground, an independent music store on 683 E. Market St. in York. York’s urban music scene was buzzing on May 17 when I pulled up to Da Underground to hear Alicia Keys’ “Teenage Love Affair” blasting from a wooden speaker that stood outside of the store’s door. Hip-hop heads can also get their grooming on at World A Cuts, an awarding-winning barbershop located next door to the Da Underground. On the other side of town, an auto show, including a DJ battle, took place. When Colon’s not running his store along with his sons (Justin, 18, and Harry Jr., 21) he’s lending a hand to people in the local music community. After the auto show, Colon (aka Harry OO) held a networking event at his store replete with a DJ, food, drinks and open mic. “I don’t just work inside of York,” the 40-year-old owner said about helping his colleagues. “I reach out to [other areas]. I do it for the love of the game.” Not surprisingly, the Central PA Hip Hop Awards (CPHHA) named him mover and shaker for 2007 and 2008. Colon also received the pioneer award from the CPHHA in 2007. And he doesn’t limit his store to albums and mixtapes (Colon gave me two bangin’ mixtapes that day). He also sells DVDs, oils, incense, sneakers, tickets for local events, and most recently, New Era fitted baseball caps. Inside Da Underground, rap magazine pages, posters and pictures wallpaper the store. Some of the photos show Colon posing with celebrities, such as DJ Pete Rock and dancing machine Chris Brown. Colon also has a Polaroid picture collection that chronicles his 11 years of business at Da Underground. He stopped his collection after he invested in a digital camera, he explained. He might not have a current Polaroid collection anymore, but he exudes swagger—before I took photos of Colon, he threw on his shades. Now that’s hip-hop.